Draw a garden on the page Whether you're a beginner who wants advice on composition and plotting out your initial drawings; a more experienced artist eager to develop your skills with color; or an old hand looking for challenging, complex textures and shapes, this unique approach to botanical illustration has something for you. 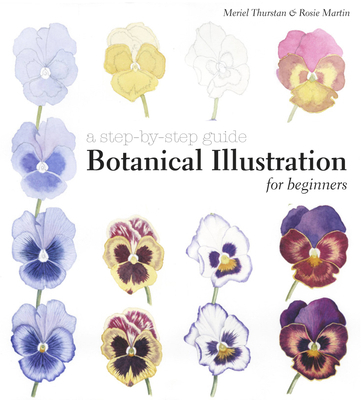 Filled with practical and inspirational worksheets, color swatches, sketches, and stunning finished paintings, it demonstrates everything you need to know about capturing beautiful botanical specimens on paper. Meriel Thurstan joined the renowned Eden Project at its creation and helped to create the Eden's Friends organization and produce its very first magazine. Meriel organizes the extremely successful annual Eden diploma course in botanical illustration. Her own botanical paintings hang in England, France, and Australia, and have become a popular highlight of each issue of Eden's Friends magazine. She lives in Cornwall, England. Rosie Martin holds a Gold Medal from the Royal Horticultural Society for her botanical watercolor painting. She is an elected member of the Society of Botanical Artists and teaches a variety of art-based subjects, including botanical illustration. She has worked in fashion, ballet and theatre; her clients have included David Bowie, Anthony Caro, Karl Lagerfeld, and Jean Muir, for whom she produced textiles and interior design prints.